Designing your dream kitchen is all about one thing: creating an individualistic space that represents you, your lifestyle, and your values. Yet, when many of us choose to tackle a modern kitchen renovation, we wind up mimicking the kitchen designer showroom, rather than personalizing the space to suit your own tastes. We know what we like, and often when a ready-made kitchen presents itself, we’re quick to jump on the bandwagon because we’re so eager to rid ourselves of our current kitchens. Pump the brakes; renovating your kitchen quickly only to find you’ve blindly recreated the Joneses’ kitchen can hurt - and doesn’t satisfy our internal need to create and curate our own surroundings. 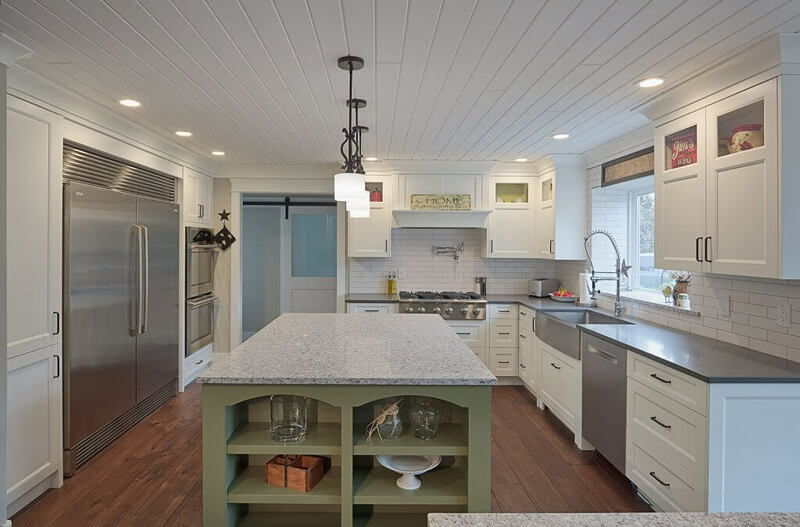 The best place to begin your personalized approach to kitchen renovation is to ask yourself what you want out of the space and to consider how you’ll use it. In this post, we’re counting down our favourite 5 ways to personalize your modern kitchen renovation. Who says you have to stick with the standard cabinetry, flooring, lighting, or countertops? No one. Experimenting with the design styles of many innovative and exciting modern interior design styles is a great way to begin exploring the realm of renovation possibilities. Giving your personality a chance to shine through may mean selecting funky, modern dishware and lighting fixtures while sticking with a more conservative cupboard door design. This style of mix and match personalization is perfect for those who are interested in biting off just enough innovation while not overdoing it. When you do mix and match kitchen renovation elements, always bring it back to a like-minded colour, pattern, texture, or layer. This link will help to bring the experiment back down to earth so the more personalized elements look like they belong; when your selection sticks out like a sore thumb, you’ll notice it too often, and this may lead you to revert back to an introverted design personality or to jump the gun and boost other aspects of your kitchen resulting in a wacky space with little unifying elements. Modernism is typified by its long, linear lines and crisp surfaces. While this style is tidy, clean, and generally appealing to the eye, it can also become dull with time. If your kitchen space feels massive and uninspired, consider what would happen if you picked a unique accent piece that went against the grain to pop the space awake. Let’s imagine your kitchen features a monochromatic colour palette, hum-drum appliances, and a wooden, square, eat-in breakfast table. 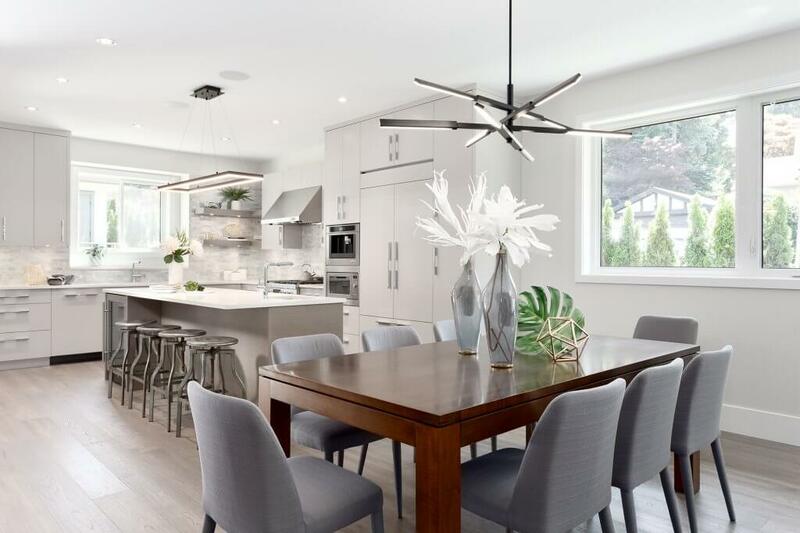 This angular design sensibility would be flipped on its head if you considered replacing the dining table chairs with fluid flair-backed, colourful chairs with metal accents, situated next to a crisp new white wall. The key to this personalization is acknowledging your space is dominantly rigid and clean-cut, and introducing a flowing, organic piece to the mix to liven up how you and your guests interact with the room. At no point within the modern design lexicon does it say base cabinets and wall mounted cabinets must look the same. If you’ve been stumped on how to personalize your kitchen renovation, look no further than your cabinetry selections. A sharp, dark wood set of base cabinets for the base of your new island and prep space cabinets would be perfectly accompanied by overhead cabinets with a white finish to liberate and separate these massive kitchen focal points in a way that helps the eye explore the room from top to bottom. Integrating cabinet doors with frosted glass inserts, or metal features is another great way to free the uppers from the lowers. The same goes for countertops. Quartz may be the popular choice for the discerning homeowner, and you may well feel like it’s a good fit for your space as well - but swapping out the quartz for the kitchen island and personalizing your space with a rich, organic butcher block countertop or a clean white solid surfacing counter is a fantastic way to not only personalize your kitchen renovation, but helps create an aura of drama and aesthetic charm within the space. Your island is likely to be your point of conversation, your gathering space, and your food prep station, so opting for a butcher block countertop is an inspired way to bring a warm humanity to an otherwise stone-cold textured countertop elsewhere in the space. Similarly, you may opt for a stainless steel island counter, or a soapstone finish to usher in a more industrial or geologic feel. Consider mixing the handles on the upper and lower cabinets according to their spirit; modern white cabinets for the uppers may look phenomenal with crisp angular handles, while the base cabinets dressed in their rich wood finish may be elevated by an ornate dark brass or gunmetal knob. Even newly upholstered chairs, bar stools for around the breakfast nook, and avant-garde artworks can help to create a space that feels as though it’s been curated from start to finish. Remember, no one is going to make you stick to one set style or modern aesthetic, or even a time period for kitchen inspiration. Some of the best personal and custom design cues are the ones we think of and immediately say: Nah, maybe that’s too wild. Well, they’re not too wild. That’s your personality coming through. Go with your gut and create a space that represents you.